The Northeast Recycling Council (NERC) has come up with a list of great tips to help reduce food waste at home. Between 30-40% of food in the US is wasted. Almost half of that is wasted in households. Check out these tips so you can reduce your impact, save money, waste less, and get creative in the kitchen. 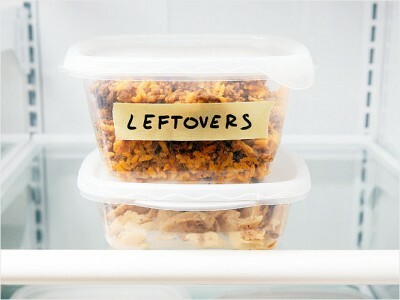 **An additional tip: Save scraps from prepping veggies (carrot ends, onion skins, garlic skins, zucchini butts, etc.) or meat and bone scraps in the freezer. Add to a large stock pot with water and simmer for a few hours to make a homemade vegetable or chicken stock. It will also make your home smell delicious. The journey of a strawberry from farm to fridge and why it's important to waste less food. Vermonters have long held fast to the traditions of thrift and resource conservation. Creating less waste for future generations and keeping our environment clean and healthy is in keeping with those traditions. So how do we reduce waste? What type of resources went into making the product? Synthetic chemicals? Recycled or raw materials? Where did those resources come from and what is the real cost of obtaining them? Is a local resource available? How much energy was used to transport the product to the shelf? Is there excess packaging? Can it be easily recycled? Is the item built to last or is there a lifetime warranty? Does the manufacturer stand behind the product or offer a way to recycle the item through them once you are done with it? Each of us makes a choice every time we make a purchase. If we make those choices with an end goal of a zero waste Central Vermont in mind, we can and will make progress towards a healthier future. There are many ways you can support zero waste and the reuse economy in Central Vermont! You may donate used clothing and household items, cars, and building materials at various locations throughout the region. When you are purchasing an item, consider shopping at area retail establishments specializing in used goods to find what you need. You stimulate the local economy, support your neighbors in need and often part or all of the proceeds go to charitable or community causes! That's a win-win-win for all! If you'd like to get your business on our map, email us. There are lots of great reasons to recycle! For example, did you know that a glass bottle that is sent to a landfill can take up to a million years to break down?! By contrast, it takes as little as 30 days for a recycled glass bottle to leave your kitchen recycling bin and appear on a store shelf as a new glass container! Glass can be recycled or reused indefinitely! Recycling glass also uses far fewer raw resources than making new glass and conserves energy as well. (Source) Plastics never break down, so sticking them in the landfill when they could be recycled into new products make little environmental or economic sense. Recycling everything we can conserves landfill space, saves raw resources, reduces energy consumption, and often saves manufacturers money. It also helps keep the environment safe and clean for every living being on the planet, and that is the key to our common future! The Great Pacific Garbage Patch from Ben Segall on Vimeo. Did you know that recycling is mandatory in the Central Vermont Solid Waste Management District? As of October 1995, CVSWMD has a Mandatory Recycling Ordinance (94-01) requiring the separation of recyclable items from the trash. The items that must be recycled in the CVSWMD comprise a large volume of the recyclable materials entering the municipal solid waste stream. Recycling conserves precious and dwindling landfill space and helps the district reach our Zero Waste goals. And don't forget... it's cheaper to recycle items than to throw them in the trash! Want to know what to recycle in the CVSWMD? How does this ordinance affect you? • Households with waste pick-up: If you have your waste picked up at your home, the hauler is required to provide for collection of recyclables as well as trash. • Renters: If you rent and the property owner provides trash collection, the property owner is also required to provide for the collection of recyclable items. • Businesses: The hauler you contract with for trash collection is required to provide recycling collection as well. • Household self-haulers: the hauler or drop-off location is required to also accept the mandatory recyclable items. In addition, the hauler, transfer station, or bag-drop is also required to give you a financial incentive to recycle. This means that recycling services must cost less than trash services. The fee charged to recycle materials cannot exceed 50% of the cost charged to collect the same quantity of trash. If your trash hauler or landlord is not offering recycling of these items, please call our Program Manager at 802.229.9383 ext. 105.